Mellan mardröm & verklighet! : LINUX - Get Rid Of PPA "404 Not Found" Messages When Running "apt-get update"
LINUX - Get Rid Of PPA "404 Not Found" Messages When Running "apt-get update"
If you type the wrong PPA address when adding a PPA or you add a PPA that doesn't provide packages for your Ubuntu version, you'll get a "404 Not Found" error message when running "apt-get update". These errors are pretty much harmless (though they probably slow down "apt-get update" a bit) but if you want to get rid of them anyway, you must disable the PPAs that cause the 404 errors via Software Sources. If you want an easier, automated way to disable the PPAs that cause these errors, give "fix404" a try. "fix404" will prompt twice for each PPA - that's because it needs to disable both the binary and the source line. By the way, if you want to check which Ubuntu versions are supported by each PPA you've added, use "checklp". 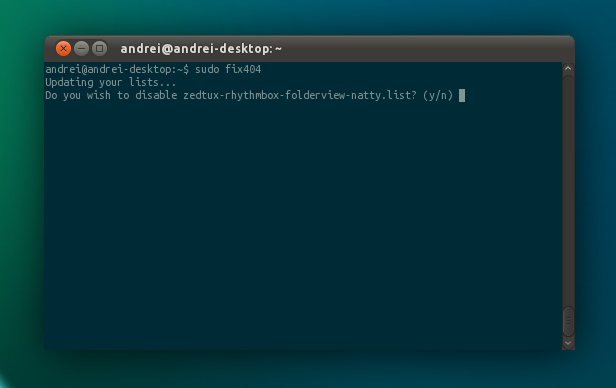 For other Ubuntu versions, you can download the .deb file from HERE. Update: the last command is required because I've found a bug in this script (the permission of the modified .list files is changed). I've reported the bug so hopefully it will be fixed. The bug has been fixed. In case you've ran fix404 before the fix and get an Update Manager error, run this command in a terminal: "sudo chmod 644 /etc/apt/sources.list.d/*". Also see: Launchpad-Getkeys, a tool to automatically import all missing PPA GPG keys. Remove ads, suggested post & page on facebook.